A Freedom of Information request has revealed Cambridgeshire Constabulary arrested seven boys for suspected firearm offences in 2015. This was compared with eight in 2014 and two in 2013. Two 17-year-old boys were charged with possession of an intimation firearm in a public place in 2015, while a 15-year-old was charged with firing an air weapon behind premises in 2014. Children as young as 10 years old were among hundreds of youngsters arrested for suspected gun crimes in the last three years in England and Wales, new figures have revealed. More than 1,500 child arrests for alleged firearm offences were carried out by police between 2013 and January 2016, with the number soaring by 20% last year, an investigation by the Press Association found. Figures released by forces under the Freedom of Information Act showed there were 1,549 arrests of children for suspected crimes involving firearms, air weapons or imitation guns, including 506 charges brought by police. The brother of a fatal shooting victim said gangs were using children to carry guns to avoid detection. Ian Cameron Swanston, whose 20-year-old brother Dorrie was shot dead in Hulme, Manchester in 1999, also believed some youngsters thought carrying guns gave them “status”. Mr Swanston, who is a counsellor and trustee of the charity Mothers Against Violence, said: “The more guns within the community, the more likely it is we will see younger children getting access to them. “Gangs use children, they use their girlfriends. They use people who the police are unlikely to search. “For some it’s about status. Having a gun is seen as having power and people become fearful of you. Britain’s biggest force, the Metropolitan Police, said 679 children were arrested for suspected firearm offences between 2013 and January 2016, including 30 children aged under 13. A total of 212 children were charged with firearm offences in the same period, the force said. Merseyside Police said 73 children were arrested for suspected firearm offences between 2013 and 2015. Fourteen boys were charged with crimes involving firearms including robbery, possession of a firearm, possession of an air weapon in a public place, sending threats, wounding and false imprisonment. West Midlands Police said 83 boys and one girl had been charged with firearm offences since 2013, including an 11-year-old boy in 2015, a 12-year-old boy in 2013 and eight boys aged 13. The Police Service of Northern Ireland said nine boys and one girl were arrested for suspected firearm offences in 2015, compared with six boys in 2014 and seven boys and one girl in 2013. Greater Manchester Police, which has investigated a string of gang-related shootings since Salford gangster Paul Massey was shot dead in July, and Police Scotland were among the forces which did not provide figures to the Press Association. :: Kent Police said a 13-year-old boy and a girl aged 15 were charged with possessing imitation firearms. 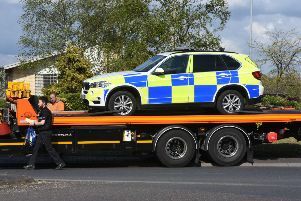 :: North Wales Police said a 13-year-old boy was arrested for possession of a firearm or imitation firearm with intent to cause fear of violence, while a girl aged 13 was charged after police seized a BB gun in 2015.
:: Nottinghamshire Police said seven children under the age of 11 had been arrested for suspected firearm offences since 2013.
:: Derbyshire Constabulary said a 10-year-old boy was among six children charged with a firearm offence since 2013.
:: Cumbria Constabulary - which investigated the deadly shootings by Derrick Bird in 2010 which killed 12 people - said 19 children arrested for suspected firearm offences since 2013 included a 10-year-old, two youngsters aged 11 and two 12-year-olds. Figures from 29 forces which provided the number of child arrests for suspected gun crimes each year showed the number rose from 423 in 2014 to 507 in 2015. A National Police Chiefs’ Council spokesman said: “Firearms offences in the UK still account for less than 0.2% of total recorded crime. These offences reflect a broad range of crimes which can include air weapons or even possession of a BB gun if used in criminal circumstances. Jack Dromey, Labour’s shadow policing minister, said: “These chilling statistics of children as young as 10 possessing firearms demand serious investigation by the Home Office.